Thomas J Husband started a retail drug business in Philadelphia sometime in the mid-nineteenth century and began manufacturing Husband’s Calcined Magnesia. Husband’s obituary, contained in the January 27, 1898 edition of the Pharmaceutical Era provided some insight into Husband and his business which had both manufacturing and retail components. Husband opened the retail store at Third and Spruce (276 So 3rd) sometime in the early 1840’s. I found an advertisement in the form of a letter to physicians dated December 9, 1843 that was published in the Medical Examiner. The advertisement used the Third and Spruce address. The advertisement appears introductory in nature so it probably isn’t too far removed from the start date of the business. Before Husband began manufacturing his calcined magnesia, Henry’s Genuine Calcined Magnesia, imported from England, was considered the industry standard. The cost of import duty priced Henry’s out of the range of the average American and this opened the door for Husband’s American made brand (which some say was blatantly copied). In a series of early advertisements Husbands is quick to compare the two products, stressing price. 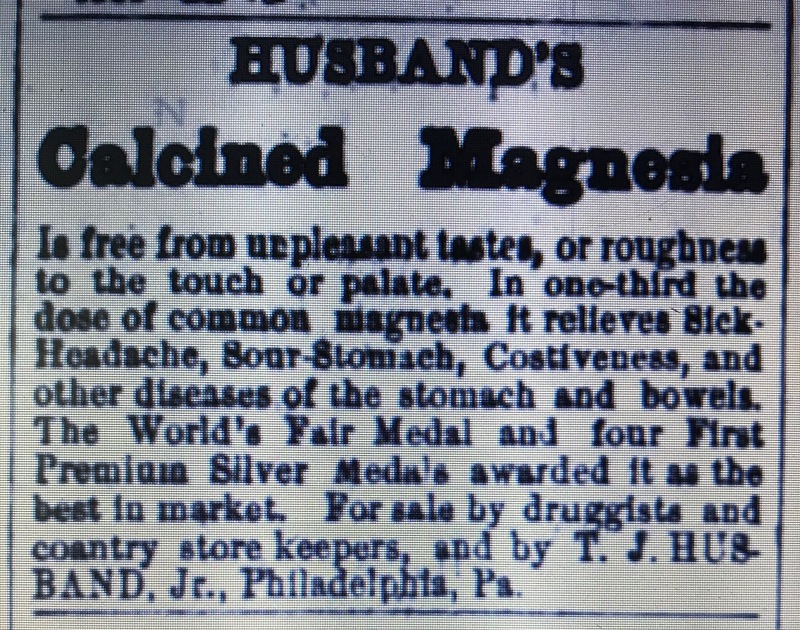 Husband’s Magnesia has received in its favor the Diploma of the American Institute, New York, and a Premium from the Franklin Institute, Philadelphia, together with the written testimonials of some of the most respectable physicians of Philadelphia, that it is fully equal to the genuine Henry’s Magnesia. The price is one third less. It appears that by the early 187o’s Thomas Jr. had taken over the retail end of the business. A series of newspaper advertisements that date from 1874 and 1875 associate him with the business in Philadelphia. Thomas Jr. continued to run the business until his death in 1913 and his estate remained listed in the directories at the S 3rd Street address through 1923. 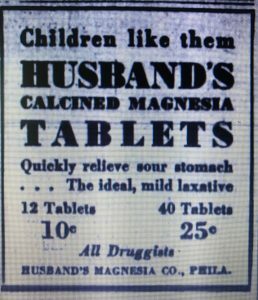 A series of newspaper advertisements in 1934 continued to list the Husband’s Magnesia Company in Philadelphia Pa. By this time, they were making it in tablet form. 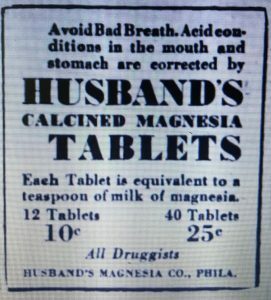 Husband’s Calcined Magnesia was included in drugstore listings well into the 1940’s so the product itself lasted at least 100 years. Early on, a carded advertisement for the Calcined Magnesia, possibly used as a handout to physicians described the many uses for the preparation. Calcined Magnesia is highly beneficial in all the diseases of the stomach and bowels which are attended with acidity, and gives immediate relief to the heartburn. The effects of excess in eating or drinking are generally relieved by it, and it affords one of the mildest and most pleasant aperients, especially to persons who, from a sedentary life or other causes are under the frequent necessity of having recourse to laxatives. To persons of a bilious or a goutly habit, it may be recommended with peculiar propriety; and its virtues have been repeatedly verified in the diseases of warm climates. Many of the complaints of children in early infancy, and even at more advanced periods, are attended with acidity, and in such cases Calcined Magnesia has a great advantage over other absorbents, viz. : that it both neutralizes the acid in the alimentary canal, and acts as efficacious yet gentle purgative. An item on Husband contained in “A Treatise on the Principal Trades and Manufacturers of the United States,” published in 1856, provided some insight into the product and it’s perceived benefits. Thomas J. Husband, N.W. corner of Third and Spruce Streets, has for some years prepared what is known as “Husband’s Calcined Magnesia,” which has obtained a very considerable reputation, and is extensively used. In the twentieth report of the Franklin Institute, the judges of chemicals assert, that this magnesia “is believed to be the best in the United States;” and some of the most distinguished professors and practitioners of medicine have pronounced it quite equal to the Genuine Henry’s magnesia. Its superior qualities consist in its being entirely deprived of carbonic acid, in its freedom from unpleasant taste, smell or disagreeable property, and without roughness or grittiness to the teeth or palate. One tea-spoonful of it is quite equal in strength to three or four tea-spoonfuls of the common calcined magnesia; thus combining smallness of dose with the most agreeable form in which magnesia can be administered. Everyone acquainted with the nature of magnesia, must appreciate the advantage of small doses that produce the desired affect. 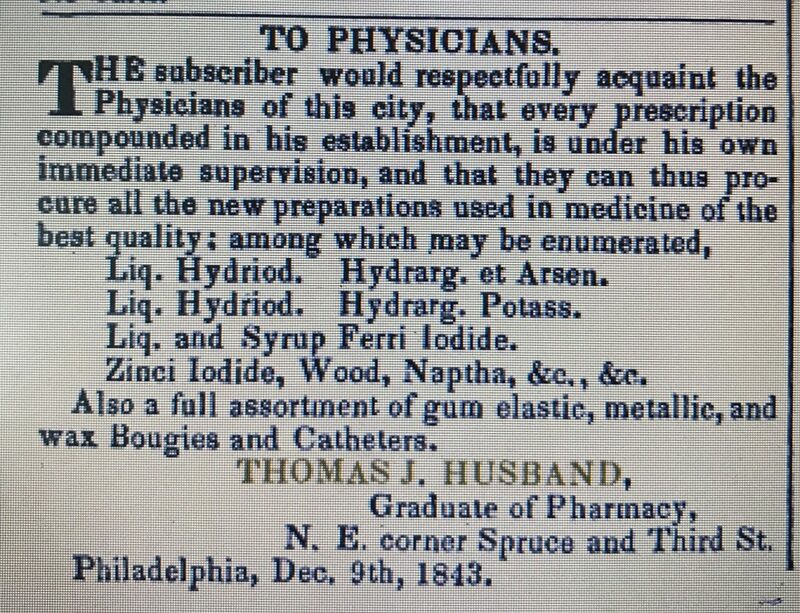 Husband’s Calcined Magnesia was being distributed in New York as early as 1846. An award the preparation received that year from the American Institute of the City of New York listed the wholesale druggist Havilland, Keese & Co., as agents. Druggists James Haviland and Theodore Keese were located at 80 Maiden Lane in the 1830’s to the 1850’s. The bottle I found is a typical Husband’s bottle embossed on all four sides: Husband’s/Calcined/Magnesia/ Philada. It’s mouth blown and probably from the early 1900’s, when Thomas Jr. ran the business.